HBD Bess! Love that photo. I find it interesting that the newspaper reports that: “today will be the first time he has ever attempted to free himself while suspended in the air” which we know is not true. I know. That's funny. That's why it's dangerous to rely too much on news stories for HH info. This looks like Bess circa early 1900s, right after they hit the big time. She had put on a few pounds by about 1916 but kept if off after that. Exactly. I think that's her 1900ish stage costume. Bess put on weight? She looked about the same weight to me all her life. I actually don't think she ever made it over 100 pounds. She was a tiny thing. I love things like this -- Happy belated birthday, Bess! I've trawled through the newspaper archives myself, and have found several instances of her getting a photo along with a mention and sometimes a full interview. I've often wondered if this was Harry's way of helping her feel less left out, or if the journalist just found her too fascinating to ignore! I always thought it was funny that Bess, who always looked so young for her age, even after she put on a bit of weight, was such a worrywart about getting older. In recall in one letter to her in 1924, Harry remonstrated with her for thinking that at 48 and 1/2 she was "old" with a "tush-tush" and "couple of fiddle-de-dees." I think then as now the wife of a daredevil makes for a great story. And she was good at interviews. 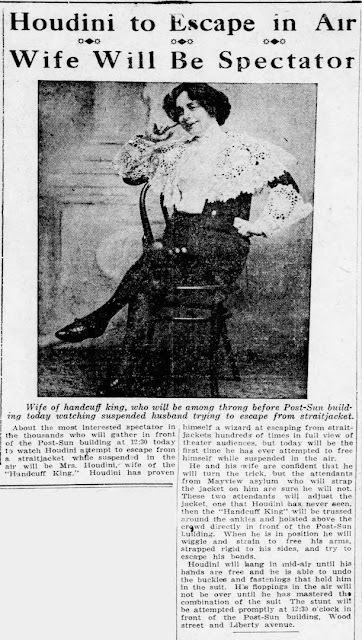 It was another way to keep Houdini's name in the papers. Like you, I love these Bess stories. As evidence in the Dietary Court of Justice, I present Henning's book. On the lower left corner of page 108 is a portrait of HH and Bess and on the next page on the lower right hand corner is a photo of HH and Bess in the lawn of somebody's house. Bess looks to me like she has on a few extra pounds. I also agree that she is wearing her stage costume. We can see a photo of Bess in a similar costume on page 39 of the Henning book. She seems to be wearing nicer shoes in the photo above. I suppose we can say that at least one of her stage costumes of choice at the turn of the century was a white frilly type shirt, black knickers with black hose and shoes.